Graduated at Turner Field Class of 42D, S/N: O-789122. Served with the 345th Bomber Grp Headquarters as B-25 pilot and was killed in a flying accident on July 27, 1943 at Port Moresby, New Guinea while piloting a small Piper Cub (L-4B). Graduated at Turner Field Class of 42D, S/N: O-789123. He was sent to Langley Field, VA immediately after graduation. Graduated Turner Field (S/N: O-789128). Was assigned to the Grenier Field, Manchester, NH after graduation on April 29, 1942, probably to perform antisubmarine missions. Capt. S/N: O-789135. He was with the 15th A.F., 464th Bomb Group (H), 779th Bomb Sqdn (H). He was command pilot/observer (not the primary pilot) of a B-24 H (S/N: 42-52463) on May 25, 1944 on a bombing run on Givors, France. The plane had left Gioia Air Base, Italy with a crew of 10 and 1 passenger (Chesser). At about 1355 hours this afternoon we were flying at 15,000 feet 10 miles or so off the French coast. Three fighters attacked Easy box. Two guys bailed out. The plane was under control. Immediately afterwards he peeled to the left and number 3 engine started on fire. He headed towards the French coast losing altitude rapidly. Another plane stood by him for a while. When last seen he was about a mile from shore. No search was made because the airplane was seen to fall over enemy territory. However, all crew members were marked DED (Declared as Dead). Source: MACR (Missing Air Crew Report): #9645. Graduated from Turner field (S/N: O-789143). Was assigned to Westover Field, Chicopee Falls, MA after graduation April 29, 1942. He graduated from Turner Field (S/N: O-789146) and was assigned to the Army Air Base in Columbia, SC after graduation. Then he served with the 319th Bomber Grp as pilot of a B-26 Marauder in North Africa. He graduated from Turner Field (S/N: O-789154) and was assigned to Westover Field, Chicopee Falls, Mass immediately after graduation. S/N O-789164. Henry graduated from Turner Field. He started out flying B-25s on submarine patrols out of Langley Field. He commanded 824th Bomber Squadn out of North Africa; Commanded the 484th Bomber Group out of Italy. He stayed in the Service for a 23 year career, flying more than 150 missions. In 1957-58 he attended the NATO War College in Paris. He was then assigned to command the 589th Missile Group at Hahn Air Force Base in Kloblentz, Germany. He returned to the U.S. and was assigned to the Air Force Research and Development Command in Baltimore and Washington. Awards: Air Force Medal, with six oak leaf clusters; Distinguished Flying Cross. He died Oct. 12, 1992 at Laguna Hills, CA. He graduated from Turner Field (S/N: O-789176) and was assigned to Westover Field, Chicopee Falls, Mass immediately after graduation. He graduated from Turner Field (S/N O-789182) and was sent to Grenier Field, Manchester, NH immediately after graduation. He served with the 497th Bomber Grp 871st Bomber Sqdn as pilot of a B-29 Superfortress in the Central Pacific. His home was Hendersonville, N.C.
His mother reported that James had died about 1954. He graduated from Turner Field (S/N: O-789183) and was sent to the Army Air Base in Columbia, SC immediately after graduation. Theater: European. He was flying transport type aircraft in the European area. During 1944 he was being transferred to the China/ Burma / India Theatre. He was on a ship on his way there when it was torpedoed. He went down with the ship. He was from Nashville, TN. Graduated at Turner Field Class of 42D (S/N: O-789184) and was sent to Langley Field, VA immediately after graduation. Killed during the War in Italy. Flew B-24’s. Distinguished Flying Cross, the Army Air Medal and four oak leaf clusters to the Air Medal. Click his name for more information. Wade Coleman was his Instructor. He was involved in a minor taxi accident with Cadet Schattan in their Stearman PT-17s on November 29, 1941 at Douglas. He took Basic at Bush Field. Milton graduated from Turner Field in Albany in April 1942 (S/N: O-789190). He then flew submarine patrol from Manchester, N.H. and also from Trinidad, South America. He later checked out on B-24s and B-29s. He then finished his military career in Albuquerque, N.M. as a Capt. instructing in B-29s. As a civilian he became the Postmaster at Cleveland, N.C. where he retired in 1982. We believe he passed away before December 22 1993. Enlisted: 4 Sep 1941 in North Carolina. He was in the 7th Air Force flying B-25s and flew 50 missions against the Japanese. Click his name for more information. Enlisted: 4 Sep 1941 in Pennsylvania. Received the Legion of Merit, Distinguished Flying Cross, Air Medal with 7 Oak Leaf Clusters, the Air Force Commendation Medal, the American Theater Medal with Battle Star and the Asiatic-Pacific Medal with 4 Battle Stars. Click his name for more information. Theater: Pacific. Highest rank: 1st Lieutenant.He was a Student Officer at Douglas. He washed out and became a Navigator. He served in the Pacific area (Australia). Enlisted: 5 Sep 1941. Evan claims to be the 1st student of the 1st class to sign in at our school at Douglas. Wade Coleman was his Instructor. Evan graduated at Turner Field as a 2nd Lt. Apr. 29, 1942 (S/N: O-789195) and was sent to the Army Air Base at Columbia, SC immediately after graduation. Evan flew B-25’s & B-26’s. He was recalled during the Korean War and served at Pepperell Air Force Base, St. Johns, Newfoundland Northeast Air Command. He retired as a Lt. Col. after 27 years active and reserve duty. Flew in anti-submarine patrol for the Eastern seaboard. Click his name for more information. He flew 58 combat missions in the Mediterranean Theater of Operations, including North Africa, Sicily, Italy and Southern France. Click his name for more information. Guy Smith was his instructor at Douglas. He graduated from Turner Field (SN: O-789200). On Dec. 25, 1944, he was flying an A20J-15 with a crew of 4 when it was hit by flak between the IP and the target near Losheim, Germany. The bomber was part of the 416th Bomb Group-L, 668th Bomb Squadron, IX Bomb Div (M) [9th Air Force]. The left wing came off and the bomber spun end over end to the ground. One parachute was seen at 6-7000 feet, but he was killed in action. Graduated from technical school in November 1942, S/N: O-856619. Served with the 305th Bomber Grp 422nd Bomber Sqdn as ground officer – maybe an aircraft maintenance officer. Enlisted: 3 Sep 1941 in Kentucky. Wade Coleman was his instructor. He took Basic at Augusta and Advanced at Turner Field in Albany. He graduated as 2nd Lt (S/N: O-789201). •B-25 school at Mitchell Field, L. I., NY. •Westover, Mass, to check out on B-24’s and Sub Patrol. •8th Air Force and heavy bombing. He flew 28 missions, with the last 3 the first daylight missions over Berlin. After “D” Day it was back to the U.S.A. to A.T.C. He left the Service as a Capt. in Aug. 1945. He then was a school teacher, Administrator, School Principal (Elementary and High School) and Supt. of 2 school districts. He was also a 4-H agent. He retired from Education in 1975 and became a full time general farmer. He graduated from Turner Field (S/N: O-789202) and was assigned to Grenier Field, Manchester, NH after graduation. He became a B-24 pilot assigned to the 486th Bomb Group 833rd Bomb Sqdn based at Sudbury, England. He flew B-17s and B-24s in the European theatre. Flew with his brother, John, on D-Day in the first 8th Air Force group over the invasion beaches. Click his name for more information. He graduated from Turner Field (S/N: O-789203) and was assigned to Grenier Field, Manchester, NH after graduation. He was a B-24 pilot assigned to the 486th Bomb Group 833rd Bomb Sqdn based at Sudbury, England. Flew with his brother, Edward, on D-Day in the first 8th Air Force group over the invasion beaches. Click his name for more information. He graduated from Turner Field (S/N: O-789204) and was assigned to Grenier Field, Manchester, NH after graduation. Later he was a B-24 pilot assigned to the 487th Bomb Group 837th Bomb Sqdn based at Lavenham, England. He flew B-17’s and B-24’s. Later he spent several years at the Pentagon. He was stationed in New Guinea for a 17 month tour. Click his name for more information. Willie Joe Duke from Texas was his Instructor at Douglas. He remembers that he was the first cadet to complete all three solos required. The class went to Augusta for Basic. He graduated from Turner Field, Albany, GA. (S/N: O-789206) and was sent to Grenier Field, Manchester, NH after graduation. Later he was in the 8th Air Force in England. He was a command pilot and operations officer in the 487th Bomber group in Lavenham, England. He was a Capt and co-pilot of a B-24 (S/N: 42-52763) assigned to the 487th Bomb Group 838th Bomb Sqdn when on the 11th of May 1944, his plane was hit by flak and caught fire. It crash landed, but he and the pilot managed to escape the cockpit and survive. The plane’s gasoline tanks exploded immediately after the crash killing some of the crew. He became a POW imprisoned at Luft-Stalag 3 at Sagan, Germany (#04783). He graduated from Turner Field (S/N: O-789207) and was assigned to the Army Air Base, Columbia, SC immediately after graduation. He served with the 341st Bomber Grp 490th Bomber Sqdn as B-25 pilot. Was involved in a minor taxi accident with Cadet McLaughlin in their Stearman PT-17s on November 29, 1941 at Douglas. He graduated from Turner Field (S/N: O-789209) and was assigned to the Army Air Base, Columbia, SC immediately after graduation. While serving at the Army Air Base on the Aberdeen (Maryland) Proving Grounds, he was killed in a flying accident on December 11, 1947 near Memphis, TN while piloting a C-47. He was a Private Pilot prior to entering the Service.Of Mercer, Pa. Willie Joe Duke was his instructor. He had Basic at Augusta, Advanced at Albany (S/N: O-789210). He was assigned to Mitchel Field, NY immediately after graduation. He was checked out in B-25’s then B-24’s. He flew 146 missions over Africa & Europe. He was in the Battle of the Dessert, flew over Italy. Then back to the USA Testing B-29’s at Clovis, N.M. He was discharged as a Capt. in Nov. 1945. Then he was production manager for the Dow Jones papers. He flew 146 missions over Africa & Europe. He graduated from Turner Field (S/N: O-789211) and was sent to Grenier Field, Manchester, NH after graduation. He became a B-24 Pilot in N. Africa. He returned and was transitioned to B-29’s and sent to the Pacific. He was later a B-29 pilot assigned to the 500th Bomb Group 883rd BS based on Saipan. He went to Saipan or Guam and made his tour of missions to Japan. Click his name for more information. He graduated from Turner Field (S/N: O-789212) and was assigned to Grenier Field, Manchester, NH after graduation. He then was a pilot assigned to the 6th Air Force down in the Caribbean Sea Area. In April of 1944 he was sent to India to fly the “Hump”. He did this for 13 months. Click his name for more information. Charles Sherrill may have been his Instructor at Douglas. He graduated from Turner Field on Apr. 29, 1942 (S/N: O-789216) and was sent to Grenier Field, Manchester, NH immediately after graduation. Theater: Pacific to fly bombers. However he did not go overseas. Most of his flying was done from Florida. After the war he became a pilot for Pan American Airlines. He retired at 60 years of age. He graduated from Turner Field (S/N: O-789217) and was sent to Grenier Field, Manchester, NH immediately after graduation. Graduated from the navigator school at Mather Field. Served with the 96th Bomber Grp 337th Bomber Sqdn as B-17 navigator and was killed in a flying accident on January 29, 1945 in England. From Huntington, L. I., N.Y. Willie Joe Duke was his instructor. He took basic at Augusta, Advanced at Albany Graduated 2nd Lt (S/N: O-789218). Then to Mitchel Field for Anti-Sub Patrol in B-25s. He also flew from Dover, Del. and Ft. Dix, N.J. Then into a Training Squadron in Hawaii for 6 months. Next on to Saipan to bomb Iwo Jima. Then back to a Maint. school at Chanute, IL. He was discharged as a Capt. in Sept. 1945. (Later became American Airlines Overseas). This then merged with Pan American. He retired in 1979 as a Capt on 747‘s. He was also an Instructor and check pilot on 707’s. He washed out at Douglas. Went on to navigation school and served in Africa and Italy. Click his name for more information. Was in the European theater. John had Basic at Bush Field and graduated from Turner Field (S/N O-789221) and was assigned to Mitchel Field, NY immediately after graduation. He spent 2 years on anti-submarine patrol up and down the east coast of the US. They flew Lockheed Hudsons and later B-24’s. Next he was sent to the 474th Bomb Grp. On his last run his aircraft was hit and they landed in Turkey. He resided there for weeks before being released. Highest rank: Captain. After the war he was in Inventory and Production Control and later in Air Traffic Control. His instructor at Douglas was Charlie Eberhardt. He went to Basic in Augusta and graduated from Advance at Turner Field (Albany) as 2nd Lt. (S/N: O-789222). He remained at Turner Field as an Advanced instructor, teaching AT-9, AT-6, AT-17 and AT-10s. After one year he went to Smyrna, Tenn. where he transitioned to B-24s. 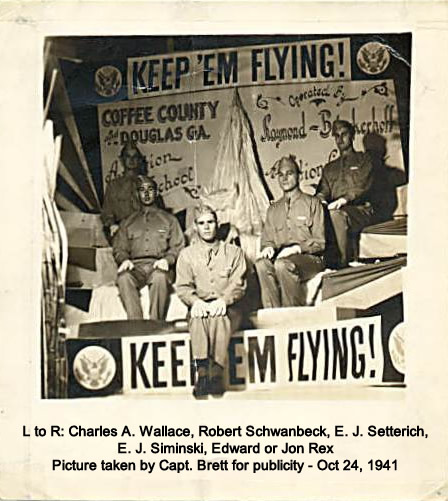 From Oct 1943 – Feb 1946, he was at Maxwell Field where he instructed B-24s and B-29s. He was transferred to Robins Field, GA with B-29s (1946), Guam with B-29s (March 1947), and Johnson Field, Japan with B-29s and C-24s. He was discharged Oct. 1947. He went to the Medical College of Georgia to become a physician, and then returned to the service as flight surgeon and later as an Eye, Nose, Throat (ENT) specialist. He continued to fly as part of his service and retired in the 1960s with over 5000 flying hours. Enlisted from MacDill Field Florida, 09-04-1941. He graduated from Turner Field (S/N: O-789223) and was assigned to the Army Air Base, Columbia, SC immediately after graduation. Born Oct 3, 1914 in Georgia. Died March 21, 1993 in Florida. Had a Bachelor of Laws from John B. Stetson University before enlisting. Enlisted September 02, 1941. He graduated from Turner Field (S/N: O-789224) and was sent to Grenier Field, Manchester, NH. Then he was a pilot assigned to the 6th Air Force down in the Caribbean Sea Area.